A question asked to me a lot over the past three years. No matter the market, year, economy etc. price is no longer the driver or limitation it used to be or perceived to be in 2018 and beyond. If price was the only factor, then wouldn’t it make sense that by this stage, there would only be one company per segment still in business. One valve company, one pipe company, one disinfection company, one screening company, etc. Battling over price, companies would have undercut each other and their profit margins into obliteration with only the cheapest vendor with the deepest pockets surviving. First time purchases are made based on what received benefits are understood as absolute. Perception of those benefits is what drives sales. People buy from who they like, trust and view as a partner. If your customers believe that you have their best interest at heart and recognize the value you bring to the relationship, you become their preferred vendor more times than not, and price then becomes less of a factor. If your customer recognizes that you care more about them than you do about the “sale,” price becomes less of a factor. Selling is the transfer of “trust” and when it’s obvious that you care, are invested and are focused on helping first, price becomes less of a factor. Quality is the unrecognized MVP in marketing. Think about brands that are more expensive but never seem to suffer through market dips, brands such as Starbucks, Mercedes, and even Chick-fil-A. They are brands that are trusted, liked, and offer a quality product and experience that price becomes not just secondary but perhaps even the last consideration for their customers. Speaking of Chick-fil-A, the company was recently rated Americans' most beloved fast-food restaurant in the American Customer Satisfaction Index's annual survey for the third year in a row. Their average annual sales per restaurant is $4.4M annually. McDonalds, who many still (for some reason) consider the king of fast food restaurants, averages $2.5M per location annually. How can that be? McDonalds has name recognition, an almost 100-year history and is CHEAPER. If price was the only consideration, or one of the most important things to consider in the minds of food consumers, then this doesn’t make sense. But of course, it does make sense. The buyers of today are DIFFERENT than the buyers of yesterday. That is a universal fact across industries, markets, and geographies. 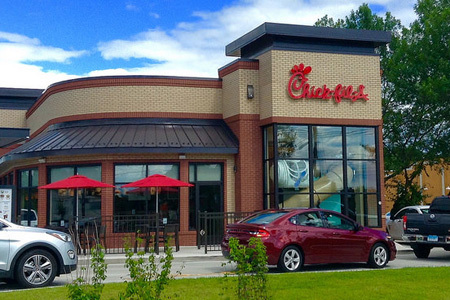 Chick-fil-A offers mouth-watering chicken sandwiches but also a polite (voted most polite fast food chain in America for the past 5 years), clean and quality experience every visit. All of this factors into the willingness of consumers to spend more per meal than with the competition. Specifically, when I take my family of four out to dinner at Chick-fil-A, I end up spending almost $40. If I was to do the same thing at McDonalds, I might get out of there for half the cost. The thing is though, we never go to McDonalds anymore. Give your customers a quality experience. Offer them what they crave. Information, insights, helpful content that positions you as a partner and one that has their best interest at heart. The sales will follow, and you’ll be winning the projects that you’ll want to work on. Price will become an afterthought.